The Sacred Hearts Academy Band Boosters cordially invite you all to join and support the Sacred Hearts Academy band students at The Road to Oz, on Sat. Oct. 24, 5:30-8:00 pm in the Clarence T.C. Ching Student Center. 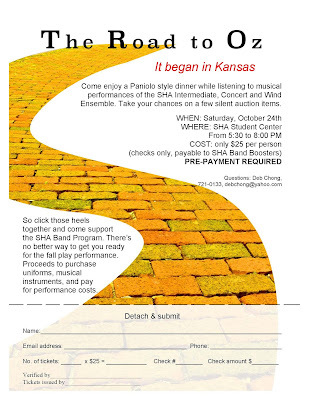 Students in the Intermediate Band, Concert Band, and Wind Ensemble will play selections from the Wizard of Oz and Wicked. Cost is $25 and tickets must be pre-ordered by Oct. 5th. This event includes a paniolo style meal with chili, rice and cornbread plus a silent auction and will support general band expenses such as replacing musical instruments, paying for new formal jackets and paying for performance costs. For additional information and questions please contact Debra Chong, SHA Band Boosters, at debchong@yahoo.com or call (808) 721-0133.